I was just as surprised to see them, as they were surprised to see me. Two of my students were standing in the elevator when the doors opened. All of us were in a hurry. They recently started to attend my yoga class with their mother. One of them is in fourth grade, and the other is in fifth. At first it was a little awkward, but now I don’t care. Plus, I’m no longer the only one always late for class. Kiley was holding what looked like a little pill bottle. As the elevator ascended to the sixth floor, she fidgeted with it some before dumping out its contents. I held out two hands to accept her gift. It was a frog! 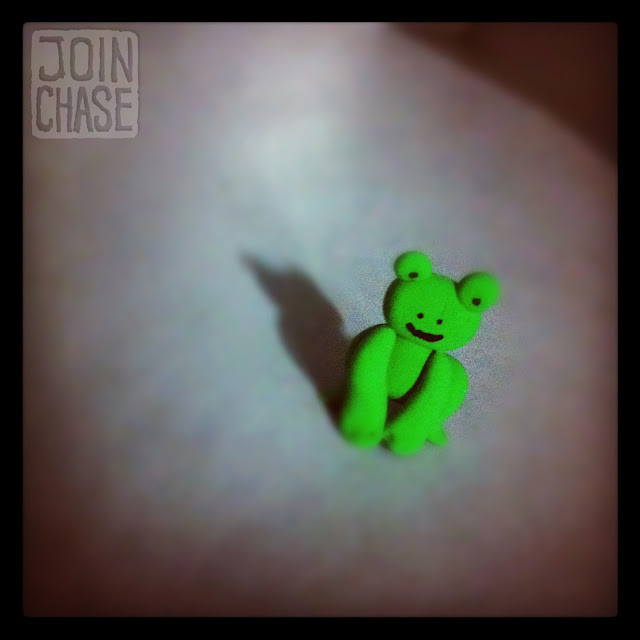 A little green frog made of clay. I couldn’t believe how detailed it was. She even added eyes, a mouth and little webbed feet. Her smile said she understood. I carefully placed my frog in a gym locker before class. Even the slightest bump would break or smash that tiny thing. On the walk home, I carefully cupped the frog in my hands as if it were real. Just as I was about open the door to my apartment, I accidentally dropped the frog and stepped on it. I set it safely on my shelf once inside. It’s the little things that count. I absolutely cherish gifts from my students. Food is always appreciated, but something handmade means so much more. Kiley is one out of hundreds of students I’ll never forget. Not only is she in my yoga class, she’s also in my after school English class. I’m thankful for any opportunity to get to know my students more.